If I am correct here...there are no reality TV stars to be found. No Bachelor cast offs, no Hills rejects, no Jersey Shore spray tanned disasters and no Teen Moms (guess the show wouldn't splurge for daycare). This season's line up is pretty snooze worthy if you ask me. I mean people somewhere obviously are fans of these people, but are they enough to give the season legs? 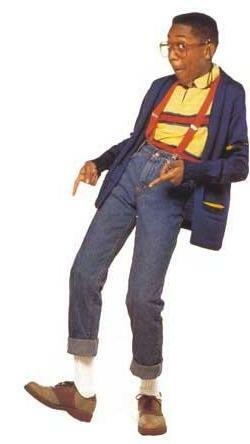 The only person I would consider routing for is Steve F-cking Urkel aka Jaleel White. What the hell happened to that dude? Missed him. The rest of the contestants include, The View co-host, Sherri Shepherd; former child star, Melissa Gilbert; tennis player, Martina Navratilova; former soap-star turned sings, Jack Wagner; football player, Donald Driver; Extra host, Maria Menounos; kid from Disney channel, Roshon Fegan; some hot Cuban guy, William Levy; singer, Gladys Knight; and singer, Katherine Jenkins. The only other notable person, besides Urkel, is Gavin Degraw. Love him...as a singer. As a dancer...ummm. Yeah, not so sure about that. This makes my decision to not watch this show that much easier this year. Thanks ABC.